A microtiter plate was coated over night with various antigens at a concentration of 5 μg/ml. After washing and blocking with PBST+5% BSA, detection was performed using Human anti golimumab (clone AbD25705, HCA274) at a concentration of 2 μg/ml followed by Mouse anti His tag:HRP (MCA5995P) in HISPEC diluent (BUF049A) and QuantaBlu™ fluorogenic peroxidase substrate. 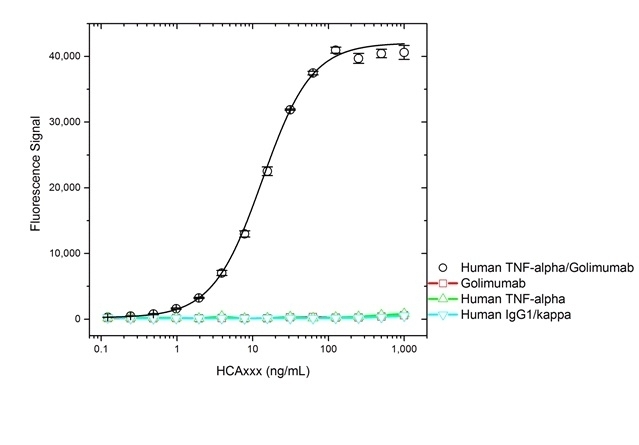 A microtiter plate was coated over night with human TNFα, golimumab or human IgG1/kappa at a concentration of 5 μg/ml. After washing and blocking with PBST+5% BSA, the human TNFα/golimumab complex was formed by adding 2 μg/ml golimumab to the wells coated with human TNFα. Detection was performed using Human anti golimumab (clone AbD25705, HCA274) titrated to the given concentrations in PBST, followed by Mouse anti His tag:HRP (MCA5995P) in HISPEC assay diluent (BUF049A) and QuantaBlu™ fluorogenic peroxidase substrate. 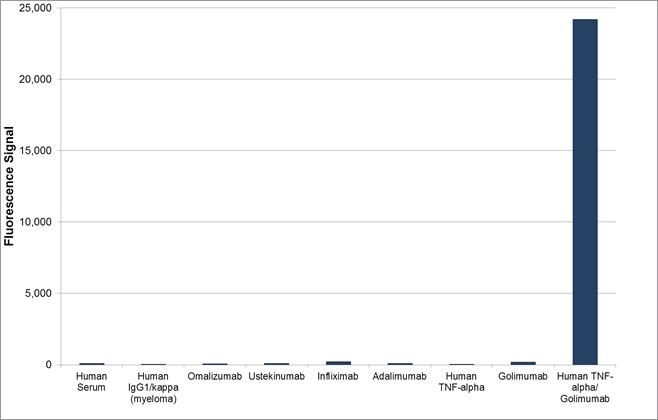 Data for binding to human TNFα/golimumab are presented as the mean of three measurements. Anti-golimumab drug-target complex antibody specifically recognizes the golimumab-TNF alpha complex and detects golimumab or biosimilars only when bound to TNF alpha. This antibody is in monovalent Fab format and is suitable for a PK antigen capture format assay to detect bound drug. Human anti golimumab (drug/target complex), clone AbD25705 is an affinity matured recombinant antibody in monovalent Fab format that specifically recognizes golimumab when in complex with its target, tumor necrosis factor alpha (TNFα). Clone AbD25705 does not recognize unbound golimumab nor free TNFα. 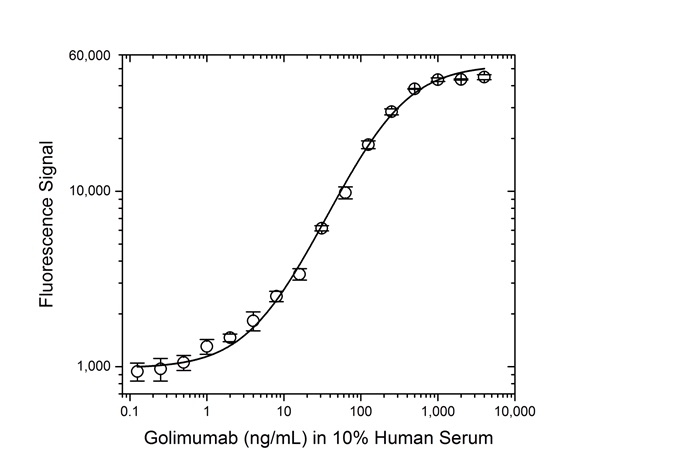 The antibody can be used in a pharmacokinetic (PK) antigen capture format assay to measure golimumab that has been captured via immobilized human TNFα. It is ideal for bioanalytical assays to measure the level of drug or biosimilar in complex with the TNFα target. Golimumab, marketed under the brand name Simponi®, is a recombinant human IgG1/kappa monoclonal antibody approved for the treatment of rheumatoid arthritis, psoriatic arthritis and ankylosing spondylitis. This therapeutic antibody, directed against TNFα, acts by blocking the binding of TNFα to its receptors, resulting in a down-regulation of the inflammatory response associated with autoimmune diseases. A monovalent human recombinant Fab (lambda light chain) selected from the HuCAL® phage display library, expressed in E. coli. The antibody is tagged with a DYKDDDDK tag and a HIS-tag (HHHHHH) at the C-terminus of the antibody heavy chain. This antibody is supplied as a liquid. The monovalent intrinsic affinity of AbD25705 was measured as KD = 6 nM by real time, label free molecular interaction analysis on immobilized golimumab in complex with human TNFα. This product may be used in an indirect ELISA to detect the golimumab/TNFα complex or to detect golimumab bound to immobilized TNFα.